Last month, we talked about “passive radiators,” which are parts of an antenna that focus signal on the part that actually receives it. The part that actually receives the signal is called a “driven element.” Surprisingly, a lot of the makeup of a large antenna can come from passive radiators, but some large antennas have a large number of driven elements. are generally referred to as Yagi antennas. Many times a large antenna will actually have one part that functions as a Yagi and another part that functions as a log periodic. It’s not always easy to tell the difference, but one key giveaway if you look at a large antenna is that driven elements are always connected. If there are small wires coming from the large horizontal rods, those are driven elements and what you have is very likely a log periodic antenna if there are a lot of driven elements. If there aren’t any little wires then it’s pretty likely that the rods are passive radiators and what you have there is a Yagi antenna. When you’re looking at buying an antenna, you have a lot of decisions to make. Log Periodic (or hybrid log periodic/Yagi) antennas are usually bigger, cost more (at least in shipping) and let you pull in signals from a wider range without needing to be rotated. On the other hand, Yagi antennas tend to be more compact but just as effective in pulling in distant signals. They’re just not always able to pull in signals from a little bit left and right as well as log periodic antennas. Log periodic antennas are also used for large frequency ranges, like the big old beasts that were required when TV broadcasting went from channel 2 to channel 83. 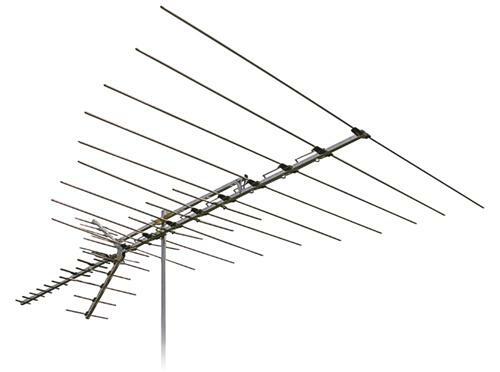 Now that most broadcasting takes place on channels 14-51 (with just a few channels still hanging around channels 7-13 and even fewer on channels 2-6) a Yagi antenna can do a lot of the hard work without being so large or complex. How important is it that your outdoor antenna is level?